The Hospice at the Fisher Home is a hospice program based in Amherst, Massachusetts who delivers hospice services to families in their own homes as well as in the hospice residence on North Pleasant Street. In 2013 WMMGA was asked to design and plant two small gardens for attractive views from two of the patient rooms. 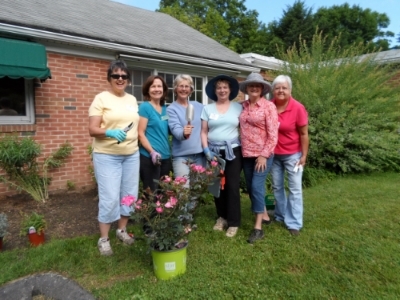 In 2015, WMMGA was asked to document, label, provide additional garden areas, and maintain the existing garden areas at the residence for patients, their families and the hospice staff. The staff at Hospice at the Fisher Home gave a Thank You Luncheon and presented us with some potted plants so we would remember them all winter. Here we are with some of their Staff and Volunteers. End of Summer and now early Autumn. The gardens are looking wonderful. Now we are planning for next year. Starting a new planting bed to be called the Memorial Garden. Prepping by making a lasagna garden to break down the sod over the winter and present us with a ready to go planting bed in the Spring. End of June, 2015 and much has been completed. The invasive Iris pseudacorus has been removed. The Amsonia relocated. Now the fun begins with planting new perennials. 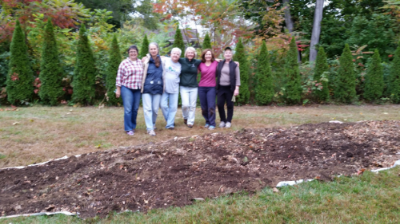 Hard work, but always lots of fun with these dedicated gardeners.